Decadent plant-based dark chocolate Easter eggs filled with a truffle-like carob peanut butter dessert hummus. Kids and adults (vegan or not!) will love this treat! Vegan, gluten-free. Easter is less than one month away! I use to by allllll the crappy candy– the high-fructose-corn-syrup-loaded jelly beans, the hundred ingredient candy bars, the artificially-flavored creme-filled eggs. That was back when I didn’t know any better. I need to know exactly what every ingredient is on the label, no exceptions! Want to know which vegan candy brands that I think are the best? Check out my favorite vegan candy list. Carob peanut butter dessert hummus is a wholesome treat that tastes decadent and indulgent! It’s free of refined sugar, gluten, and dairy. Vegan. Dessert hummus is all the rage right now! I usually make savory beet hummus or roasted acorn squash hummus for a healthy snack but this dessert hummus recipe is delish! My husband has a major sweet tooth and he would eat dessert every night if I had it in the house. So I wanted to have something easy and healthy that I could give him that I wouldn’t feel bad about him eating. 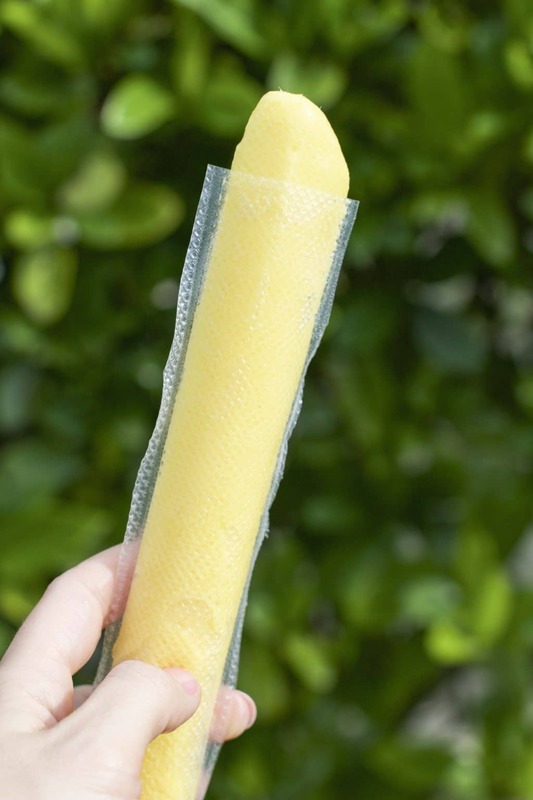 Make your own mango popsicles with only 2 wholesome ingredients! These popsicles are refined sugar-free and require only a few minutes to assemble using a FoodSaver vacuum. The perfect summer treat that everyone will love and you can feel good about eating! Dairy-free. I can’t believe today’s the last day of June already. Before we know it, it’s going to be September and the holidays will be right around the corner. I’m actually really excited about it. Summer is a slow time for us. I love all the rainy days and summer inspired recipes that flood my Pinterest feed. My favorite summer activity is floating in the pool on a raft with a popsicle in one hand a book in the other. I’m currently reading Game of Thrones. If you have any good book recommendations for me, please leave the title in the comments!